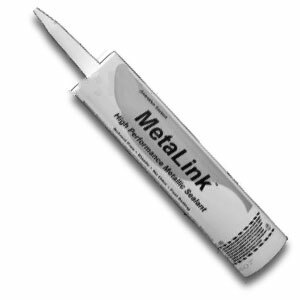 MetaLink is a specialty Neutral Cure Silicone Sealant for exterior or interior applications. 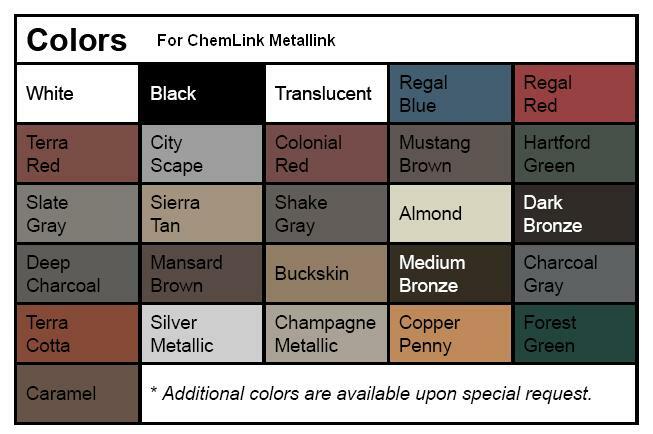 Colors are available to match most popular metal roof or siding colors. Joint movement +/-25%. Limitations: Painting is not recommended. Repairs require removal before re-caulking (cured silicones are difficult to adhere to). We suggest Duralink which has +/-50% joint movement and other benefits. Metalink is also effective for sealing automotive seams, RV's, and transportation equipment where corrosion from salt spray, and vibration and joint movement is severe. MetaLink tightly seals agricultural buildings, silos and storage bins. It is also an excellent sealant for aluminum doors and windows as well as metal trim. Metalink specifically formulated for applications on metal roofs, gutters, downspouts, and other metal architectural surfaces such as walls, windows, doors and fixtures. MetaLink bonds to aluminum, steel, copper, Kynar 500® PVDF and Tedlar® PVF. MetaLink is also effective when applied between metal and non-metal materials such as masonry, glass and engineering plastics such as polycarbonate, vinyl (PVC), fiberglass (FRP), and acrylic. METALINK contains no solvent. It cures to a resilient silicone rubber seal that exhibits no shrinkage in about three to seven days. Cure rate varies with temperature.